Car camping is also referred to as 'tent camping', where you drive to your destination and pitch a tent to sleep in. Minimal crowds w/ maximum scenery is what most seek. Peace and quiet all weekend is often the goal. Hiking trails, biking trails, horseback trails too. Few RV campers, if any; Small campgrounds located on one-lane roads, or better yet - dirt roads! Whether you seek a developed campground: paved, level parking spot w/ toilets; or a primitive spot on a dirt road w/ creek and rock campfire ring... we have all of them listed on this web site. National Parks, National Forests, State Parks, county campgrounds, backpacking trailheads, free car camping, PG&E lake camps, 4x4 camp sites. Here at Total Escape we focus mainly on the secluded camping - off the beaten path, forested back roads camp sites at no charge. Yes, free camping does exist inside California - if you know where to look, have a capable vehicle to reach it and also get the proper topographic maps. Dispersed camping requires that you obtain a free camp fire permit. Always study maps before hand at home and have a plan B and C ready when traveling. 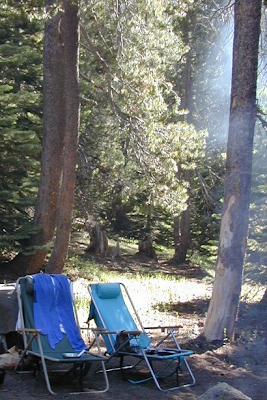 Some best hidden campgrounds published 10 or 20 years ago, may be well-known and busy today. With the California population continuing to grow, traveling further back into the boonies may be needed to avoid the mass of tourists. Lakes, reservoirs, rivers and beaches are the most popular locations sought, especially in summer months... so you may wanna keep that in mind. Below is a list of various terrains w/ great destinations all around California, w/ campgrounds or camping close by. For real peace and quiet, choose a small campground at the end of a road, or a free camp on the remote back roads. Free camp sites may seem hard to come by in Southern California - or anywhere along the ocean on the popular west coast, but these no charge camps are quite common in the rest of the golden state. 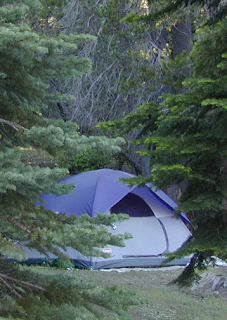 The very best camps are found inside the Sierra Nevada mountains and most any forests of Northern California. Free camping usually means remote, secluded and private. Many accessible via dirt road. Creekside, lakeside, 4x4 not required. Minimal tourists, maximum privacy. USDA rangers like to call it dispersed camping. Some parks refer to it as open camping. RV campers refer to free camp sites as boon-docking. If you wish to camp overnight outside of a developed campground, then you will avoid fees and steer clear of any crowds. Many Californians crave the seclusion and privacy of the back roads, totally saturated inside real nature with the wildlife and all. Developing your self sufficient camping techniques means you will have more options and skills to choose your perfect camp site. regular tent campgrounds are managed camping parks with marked camp sites, picnic tables, campfire rings and quiet hours (10pm-7am). Pit vault toilets are common, but flush toilets are rare. Fees for camping overnight vary from $10 to $30 per night. Certain small campgrounds found in National Forests are so far back in the boonies that the rangers rarely get to them, so these remote campgrounds are often at no charge. Southern California is less likely to have free camping since most areas located near beaches, mountains, and any lakes are already developed. Although Southern California does have vast deserts for free car camping, just not so popular in the summer months w/ triple digit heat. Northern California and the Sierra Nevada mountains are both excellent regions to search for free camping spots. Creeks, waterfalls, small lakes, meadows, dense forests and wilderness trailheads.